Description: Wingspan 78-90mm. Adults are greenish-brown with two lateral white stripes on the thorax. The abdomen has black and white bands with a series of small white marks along the dorsal surface. 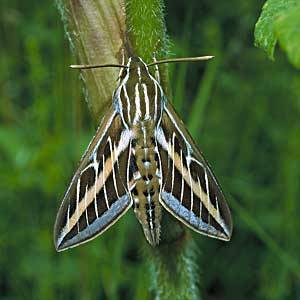 The forewings are greenish-brown, with a pale ochreous stripe running from the base to the apex of the wing. This is overlain with a series of fine white lines. The hindwings are pinkish red with a small white patch near the basal area of each wing and a black band near the terminal border. Flight Period: In N. Ireland adults have been recorded in every month between February and June and in October and November. Status: A rare migrant that appears very occasionally in N. Ireland. It has been recorded in all counties with the exception of Fermanagh. It has not been seen since 1992, when a single adult was found at Bangor, Down. The earlier records have been from Helen's Bay, Down 1943; Ballymagorry near Strabane, Tyrone 1985; Belfast 1888, 1943 and 1966; Jerrettspass, Armagh 1940; Larne, Antrim 1938; and Londonderry 1906. Ecology: An attractive moth, which is rarely seen in N. Ireland. Adults have a long proboscis and are often seen abroad at dusk hovering while feeding from favoured plants such as Red Valerian Centranthus ruber. The larvae are known to feed on bedstraws Galium spp. willowherb Epilobium spp and Knotgrass Polygonum aviculare. World Distribution: Cosmopolitan except for Arctic and tropics.